Personal data is increasingly important in our lives. We use personal data to quantify our behaviour, through health apps or for ‘personal branding’ and we are also increasingly forced to part with our data to access services. With a proliferation of embedded sensors, the built environment is playing a key role in this developing use of data, even though this remains relatively hidden. Buildings are sites for the capture of personal data. This data is used to adapt buildings to people's behaviour, and increasingly, organisations use this data to understand how buildings are occupied and how communities develop within them. A whole host of technical, practical, social and ethical challenges emerge from this still developing area across interior, architectural and urban design, and many open questions remain. 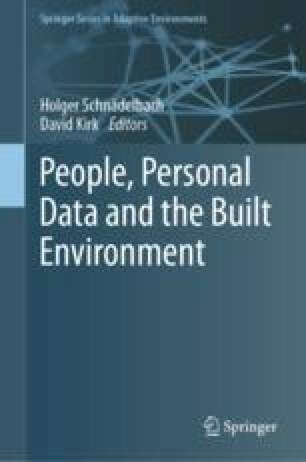 This book makes a contribution to this on-going discourse by bringing together a community of researchers interested in personal informatics and the design of interactive buildings and environments. The book’s aim is to foster critical discussion about the future role of personal data in interactions with the built environment.